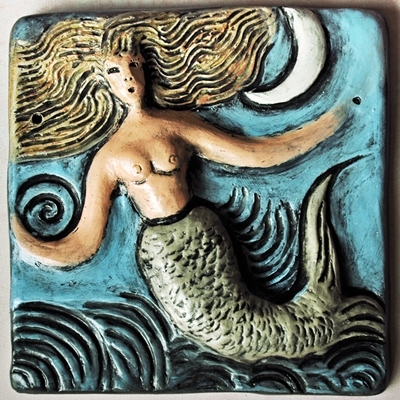 Hand painted tile/plaque which hangs on the wall. A mermaid caresses a moon and spiral, depicting timelessness and time, the cycles of life, with seashells and ocean waves. Colours may be customized, or inquire as to what may be ready for shipment. Measures approximately 5" (12.7 cm) x 5" (12.7 cm). 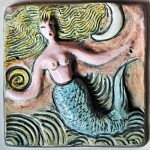 This is an original design by Canadian ceramic artist, Teresa Carey. This is an example of a more pastel treatment.